It used to be, that you could only edit your replies on Facebook, which would be very annoying when you posted something quickly and realized it really didn't sound quite as good as it was in your head. Oops! 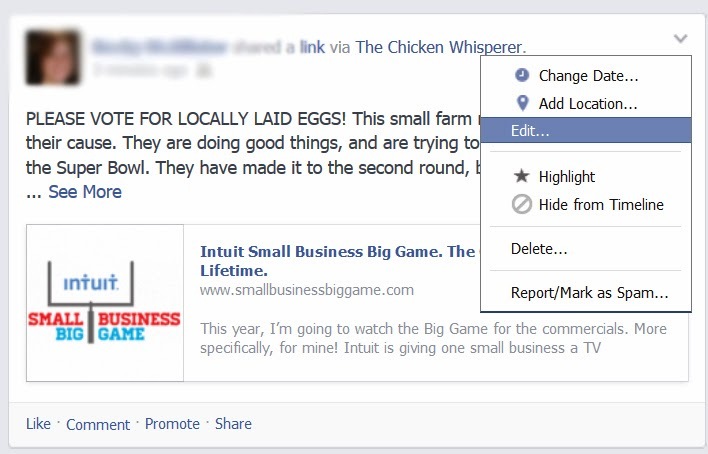 Now you can correct those faux pas with a click of the drop-down menu. As shown in the example, click the arrow and select edit. If you comment on someone else's status, it is in a little bit different spot but still to the right but it looks like a pen which will let you know when you hover over the icon (or pencil). Facebook and Recipes, Lots of Recipes!